Does the world really need yet another digital camera? The correct answer would be an unequivocal and resounding, “Yes!”. Well, you know that the camera industry is going to continue moving forward with ever higher resolution, not to mention advancements in video recording technology, but how about the operating system of the camera? That has more often than not been overlooked, so Samsung might be on to something here with their maiden attempt at an Android-powered camera, the Samsung Galaxy Camera. Yes sir, we are referring to the mobile operating system from Google that sees actions on smartphones and tablets, now making its way to a camera. How does it fare? Hit the extended post to know more. 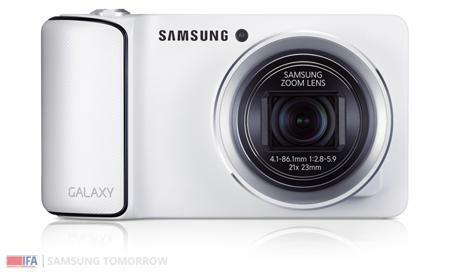 The Samsung Galaxy Camera can be said to be a smartphone sans the “phone” bit. After all, it will come with the most recent Android 4.1 Jelly Bean operating system, not to mention carry a slew of connectivity options that would even turn some smartphones green with envy – such as 3G, 4G and Wi-Fi support. I am not quite sure whether mobile carriers will soon put the Samsung Galaxy Camera up for sale on a 2-year contract with a data plan thrown in for good, but time will tell. The Samsung Galaxy Camera can be said to be the best Android-powered dedicated camera at this point in time, as its only competitor would be the Nikon Coolpix S800c, but that certainly loses out to the Samsung Galaxy Camera in many aspects. For instance, the Samsung Galaxy Camera has the latest Android operating system version as opposed to Android 2.3 Gingerbread on the S800c, while it has a 21x optical touch zoom lens (vs 10x optical zoom on the Nikon) and a 16-megapixel BSI CMOS sensor. You can choose from three options – a 3G and Wi-Fi version, a 4G LTE and Wi-Fi version or a Wi-Fi-only model. What is your flavor of the day? I suppose that budget also has plenty of say in the final purchase decision.